HDPE Electro Fusion Welding Machine Available size from 20 to 200mm, 20 to 315mm, 20 to 630mm Available. Electrofusion welding machine from 20 to 200mm with complete fusion range and multi function touch screen with automatic control and manaul fusion range. Electrofusion machine comes with scanner and scrapper. 6. By – real time monitoring weld status, abnormal welding process could be terminating in short time. 9. USB Interface to Data Storage upto 4000. HDPE Fusion Machine is available in 20mm to 315mm with best quality and one year warranty.It is available with best-advanced features of the market. With Touch Screen, Scanner, Scraber and USB for data output. 9. USB Interface to Data Storage upto 4000 records. (2) Read in by bar code scanner. Sizes Available, 20 to 200mm, 20 to 315mm, 20 to 500mm and 20 to 800mm. Plastic pipe welding machine, saddle fusion welding machine, electrofusion welding machine, electric hdpe pipe welding machine, hdpe electricial pipe jointing machine, saddle fixing machine and electrofusion pipe welding machine. By – real time monitoring weld status, abnormal welding process could be terminating in short time. Performance Warranty : One Year. Calaibration Certificate Provided validity One Year.. 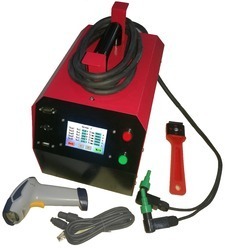 Looking for Electrofusion welding machine ?